The Guinea Pig, also called a cavy, is one popular pet! 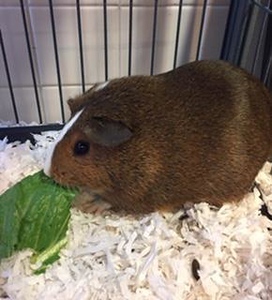 We have four Guinea Pigs available at our Newington location. They are relatively easy to care for, docile and are responsive to kind and gentle handling. When handled correctly, guinea pigs enjoy being picked up and carried. They are curious critters and enjoy exploring, especially when on familiar territory. They are not as likely to investigate the world with their mouths as some of their rodent family friends but they are curious critters and enjoy exploring, especially when on familiar territory. They can also be trained to respond to tricks and, when bonded to their owner, may respond eagerly to the sound of his orher voice! Guinea pigs are social animals who prefer to live in small groups. Two or more females will become great friends. If you want two males, it’s best to choose two babies from the same litter. Since guinea pigs multiply rapidly, keeping males and females together is not recommended. Just like humans, guinea pigs need to get vitamin C from their diet, so they need special food and fresh veggies. Guinea pigs can live in pairs or alone. On average, cavies weigh 2 pounds and can live 6-8 years with proper care. Posted in Newington Town Crier, Newington News on Thursday, 28 March 2019 08:02. Updated: Thursday, 28 March 2019 08:05.